Samsung will start construction on the Samsung CE Ho Chi Minh City Complex (SEHC) at the Ho Chi Minh City Hi-tech Park with a total investment of 1.4 billion USD, reported Dau Tu (Vietnam Investment Review). Once the 70-hectare complex goes into operation a year from now, it will be a base for Samsung’s research and development (R&D) activities and manufacturing hi-tech electronic products. According to the firm’s plan released in October last year, it will produce consumer electronic goods, such as Smart, LCD and LED TVs, during the first phase of the project and the second phase will focus on other electronics. The complex will be a zone for high technologies, similar to other Samsung facilities in northern Bac Ninh and Thai Nguyen provinces, where the latest high-end TV series will be manufactured to supply the global market, Deputy General Director of Samsung Vina Nguyen Van Dao said at the launch of the new curved SUHD TVs last weekend in central Da Nang city. It makes Vietnam a production base for not only mobile phones but also TVs and other consumer electronics, significantly adding to the country’s export revenue. Last year, the curved UHD TVs helped the manufacturer maintain its number one position in the world’s television market for nine consecutive years with 29.4 percent of the market share. 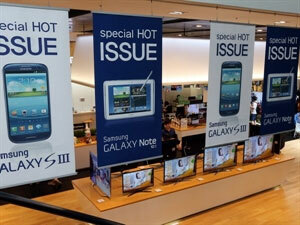 Samsung also led the way in Vietnam with 35 percent market share. Its latest series of SUHD TVs was first launched at the Consumer Electronics Show (CES), the largest event of its kind, in Las Vegas, the United States in early January this year. 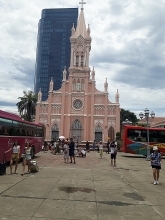 Samsung first invested in Vietnam in 1995 but made itself known in recent years with its construction of two hi-tech complexes to produce mobile devices and components in Bac Ninh and Thai Nguyen provinces with a combined investment of 7.5 billion USD. The two facilities together exported over 26.25 billion USD worth of products last year.